PMI rises to 13-month high on pre-Brexit preparations and record stock-building. Larger firms see greatest boost. Producers of intermediate goods report further steep export loss. UK manufacturing reported a surge in production and stock-building in March as companies prepared for Brexit but also indicated a further switching of supply chains out of the UK by European customers. While the manufacturing upturn may temporarily lift economic growth in the first quarter, longer term downside risks have increased: the temporary boost will likely move into reverse and EU supply chains could continue to divert away from the UK, depending, of course, on the Brexit developments in coming months. 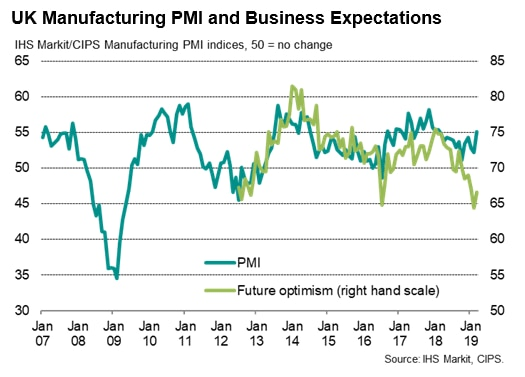 A marked upturn in the pace of manufacturing growth indicated the headline IHS Markit/CIPS UK Manufacturing PMI rising from 52.1 in February to 55.1 in March, its highest since February of last year. 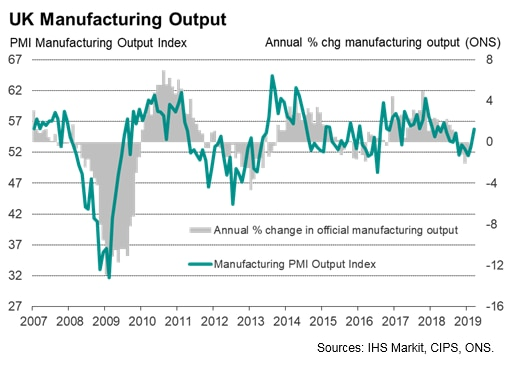 Key drivers of the upturn were the largest monthly rise in factory output since May of last year and by far, the biggest jump in firms' inventories ever seen over the 27-year history of the survey. However, both developments reflected firms and their customers stepping up their preparations for the UK's scheduled withdrawal from the EU, for which, no agreed deal between the UK and EU was yet in place during the period of data collection. The survey's output index rose to a ten-month high with around one-in-three companies reporting increased production against one-in-six reporting a decline. 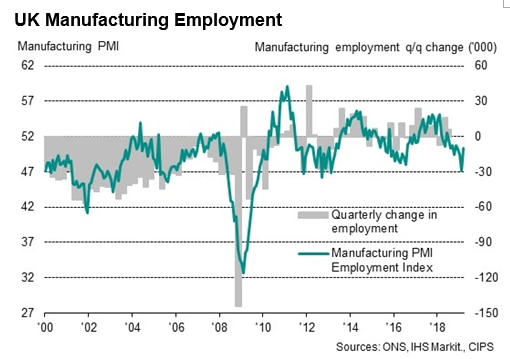 Historical comparisons with official data from the ONS suggest that the March reading is indicative of manufacturing output growing at a quarterly rate of approximately 0.5%, providing the first positive growth signal since last November. 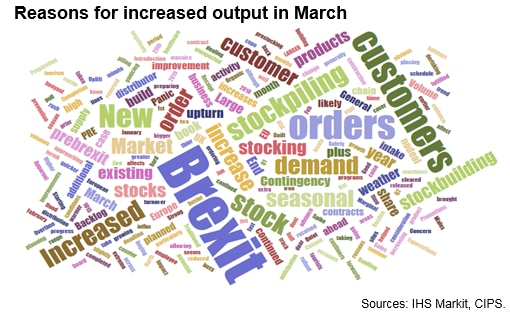 However, with some 42% of those firms that gave a reason for higher production in March attributing the improvement to pre-Brexit stockpiling by customers, the survey findings indicate that the production trend could weaken in coming months as this temporary boost moves into reverse. 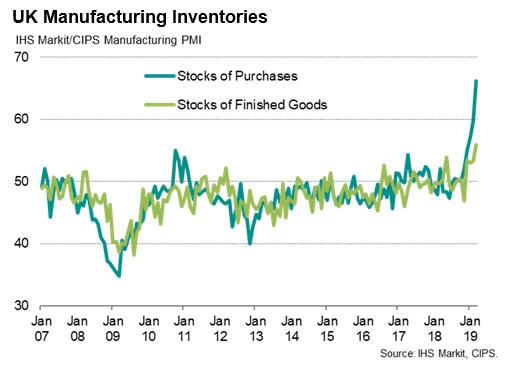 Manufacturers themselves were also keen to build safety stocks of raw materials, with the Stocks of Purchases Index hitting 66.2, far exceeding the prior survey records seen in the previous two months. Prior to 2019, the highest this index had reached was 55.0. Some 43% of firms reported higher stock levels against 11% recording a decline, with around 80% of those that gave a reason for higher inventories citing pre-Brexit stockpiling, especially imports from the EU. Similarly, stocks of finished goods showed the largest monthly rise since data were first collected over 27 years ago, predominantly driven by firms preparing for potential Brexit-related disruptions to production. Employment stabilised after having declined markedly in February, though was likewise buoyed in part by firms taking on staff to deal with the additional pre-Brexit workloads. The pre-Brexit boost was concentrated among larger companies, which reported the biggest surge in production since late-2017. 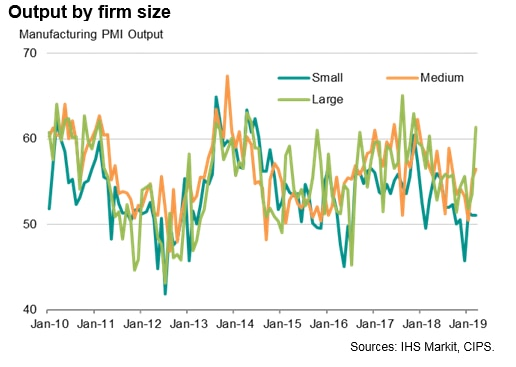 At the other end of the scale, smaller manufacturers reported only a marginal rise in production on average as their new orders fell for a fourth successive month, contrasting with ongoing order book growth at larger firms. Inventory building was also far more widespread among large firms than smaller companies. Sector divergences highlighted a potentially more ominous adverse impact of Brexit uncertainty: producers of intermediate goods (input suppliers to other firms) reported a far weaker order book trend than producers of consumer goods and capital goods (such as plant and machinery), in turn reflecting a steep drop in export orders which was partly blamed on EU customers switching away from UK suppliers. 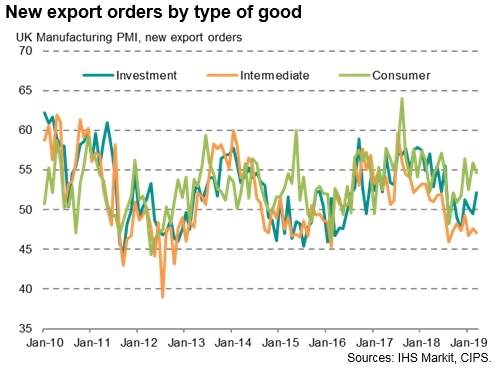 Exports of such intermediate goods have now fallen for nine successive months, with the first three months of the year seeing the steepest quarterly decline since mid-2015.